I JUST FINISHED THIS ONE YESTERDAY. BEEN WORKING ON IT FOR 2 WEEKS AND DON’T LET THE LOOKS FOOL YOU ITS 100% READY TO GO. 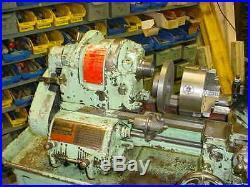 THIS IS A SOUTH BEND HEAVY 10 TOOLROOM LATHE. 10″ SWING X 28″ CENTERS. 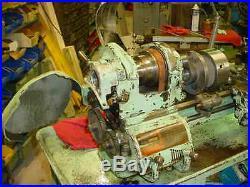 3/4 HP 220 3 PH MOTOR. NEW 6″ 3 JAW CHUCK WITH A 2 1/4″-8 BACK. USED 7 1/2 4 JAW SOUTH BEND BRAND. 1 3/8 SPINDLE HOLE. 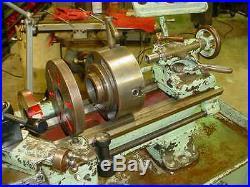 2 1/4-8 THREADED SPINDLE. NEW QUICK CHANGE TOOL POST W/ 5 BLOCKS. 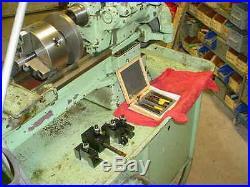 NEW 5 PC SET 1/2 INSERT TURNING TOOLS. 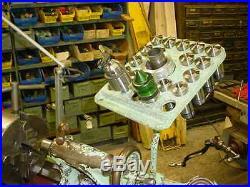 NEW 15 PC SET OF 5-C COLLETS WITH THE COLLET RACK. 5-C HAND DRAWBAR WITH NOSE PIECE & REMOVER.  NEW # 2 MT LIVE CENTER. 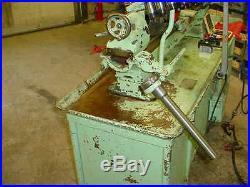 USED 1/2 DRILL CHUCK. 6 DOG DRIVER PLATE. NEW NUTS IN THE COMPOUND & CROSS SLIDE. WAYS IN GREAT CONDITION AROUND A. 006 LIP ON THEM. NEW 80 TOOTH GEAR FOR THE QUICK CHANGE FOR-REV. 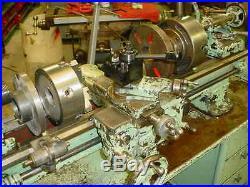 I DIDN’T HAVE TO PULL THE SPINDLE IN THIS LATHE ITS PERFECT AND DOES NOT GET HOT AFTER RUNNING FOR 2 HOURS. ALL THE GEARS ARE 100% IN THE THREADING BOX AND FEEDS ON THE CARRIAGE ARE PERFECT ALONG WITH THE 1/2 NUTS. ITS UNPAINTED DUE TO MY PAINTER HAVING SOME HEART PROBLEMS. THE ONLY THING YOU ARE GOING TO HAVE TO DUE IS SET THE GIBS TO YOUR LIKEING. TO WATCH THE VIDEO GO TO YOUTUBE AND SEARCH RUMFORD SUPPLY. 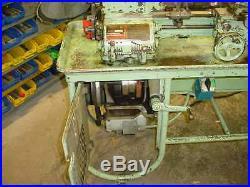 RUMFORD SUPPLY & MACHINERY COMPANY INC. SERVING LARGE & SMALL SHOPS FOR 57 YEARS. 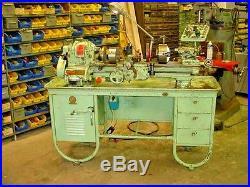 The item “1956 HEAVY 10 SOUTH BEND TOOLROOM LATHE WITH LOADS OF TOOLING VIDEO” is in sale since Monday, June 12, 2017. 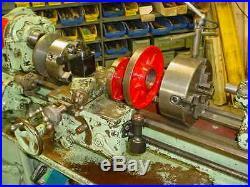 This item is in the category “Business & Industrial\Manufacturing & Metalworking\Metalworking Tooling\Equipment Specific Tooling\Lathe”. 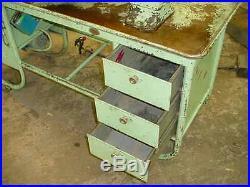 The seller is “toolingking” and is located in Seekonk, Massachusetts. This item can’t be shipped, the buyer must pick up the item.